This is self funded NHS style treatment with fixed stainless steel braces for under 18 and is offered at a discounted rate. This type of treatment is available for children and teens who don’t qualify for treatment under the NHS. There is a wide range of orthodontic treatment available for both children and adults using the latest technology and less visible braces. These include the Damon System ceramic braces and clear aligners like Invisalign Teens. Come in for your complimentary consultation and an informal chat to discuss issues that bother you and find out more about how we can help (No clinical assessment is included with this consultation). We offer “Simple Fix” braces which give a quick fix to the front teeth and an improvement to your smile. Such a quick fix may be appealing and similar solutions are now offered by some dentists with no specialist orthodontic training. Such treatments may result in undesirable side effects and treatment may be prone to relapse. Here at Glasgow Southside Orthodontics we have the training and expertise to discuss with you the options of less visible braces that are better suited to your needs. Remember there are treatment alternatives that may work just as quickly, more compatibly and probably at a lesser cost but still give you a better long term result. We discuss all treatment options with you and help you make an informed decision. Our range of 'Simple Fix' braces are available in stainless steel and ceramics. Brands such as 6 Month Smiles, fast braces, Inman, Quick Straight Teeth are orthodontic appliances, often advertised by dentists offering a quick fix. All these branded braces follow the same basic principle used by Specialist orthodontists for years. However, we do not have to pay the expensive laboratory bills that non-specialist dentists do, so we offer such treatment for a very competitive cost. Please get in touch for more information on our range of 'Simple Fix' braces. Our video section has a series of videos with information on the self funded treatments we offer for adults & children at Glasgow Southside Orthodontics. These include the Damon System, Damon Clear System, Insignia Advanced Smile Design and Invisalign. These braces are usually made from stainless steel and they are the most common type of braces used for the treatment of children although they are also used by adults. Traditional wire braces are the standard braces used in NHS funded treatment. *Based on £350 deposit followed by 10 equal payments of £100. Pay in full at the beginning of your treatment to qualify for a 5% discount. These are very similar to traditional fixed braces used through the NHS but are made from hard ceramic which makes them less visible. *Based on £450 deposit followed by 10 equal payments of £110. The Damon System is based on a unique treatment philosophy that goes beyond straight teeth. It takes patient’s face shape and profile into account and considers how the face changes with age. This modern version of metal braces, with it’s small size and comfortable contours is perfect for those who don’t mind showing off their braces. Many people see a noticeable change not just in their teeth, but in their entire face. *Based on £800 deposit followed by 10 equal payments of £240. 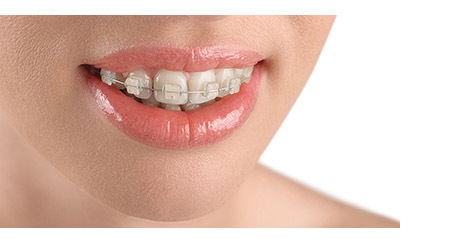 These clear braces are perfect for those who want a more discrete option than the metal braces. Virtually invisible, Damon Clear has distinct advantages over traditional braces and aligners. Damon Clear is part of the innovative Damon System, which combines tieless braces with high technology archwires that are clinically proven to move teeth fast and comfortably with truly spectacular smile and facial results. Damon Clear combines the best of traditional clear braces and invisible aligners to deliver a discrete treatment experience with results that go beyond straight teeth. *Based on £850 deposit followed by 10 equal payments of £270. With this system you get to see your finished smile before you even get braces! We can preview a digital simulation of your treatment before the treatment starts. Most fixed braces on the market are generic and are manufactured to fit all. Insignia is an orthodontic treatment with fixed appliances (mostly Damon System) that is tailored to the individual patient. The 3D software allows the orthodontist to create a precise personal treatment plan and uses fully customized brackets and wires that fit the contours of your individual teeth. Insignia Advanced Smile design costs an additional £200 to the Damon Clear System prices outlined above. Invisalign, Invisalign Lite & Invisalign i7 apliances are a series of clear removable aligners that are customised specifically for your teeth. Unlike fixed braces, there are no wires or brackets. By using 3D technology, you can visualise what your smile is going to look like before you start with treatment. *ClinCheck is the virtual simulation of teeth movement which allows patients to visualise the predicted outcome of treatment.